The 466th Soundtrack of the Week is something of a time capsule. This kind of movie was a whole thing in the mid-twentieth century. I suppose there are movies these days which perform the same function but so much has changed; it's a different language. 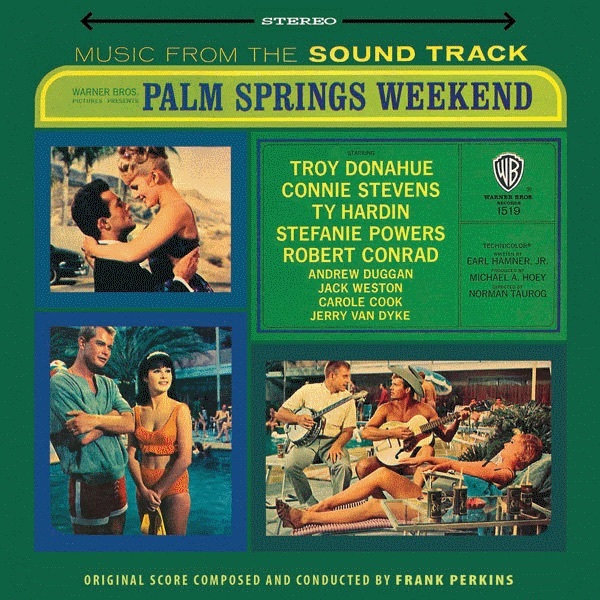 This week we're listening to the music for Palm Springs Weekend, which is mostly by Frank Perkins. This is the original album release, so it features lots of songs performed by stars of the movie. Troy Donahue sings "Live Young", which sounds like it goes with or near an opening credits sequence or some other sort of main title business. Mainstream pop culture of his era, the early 1960s, is still how we think of the 1950s, and this song is squeaky clean and upbeat. Folk music had been a big deal for several years so The Modern Folk Quartet is here singing "Ox Driver", which is actually a pretty catchy and exciting song with a lot of momentum and some impressive finger picking and vocal harmonies. Connie Stevens sings "What Will I Tell Him", a beautiful love song that's been very tastefully arranged for strings and combo with electric guitar. There's a goofy comic riff on "Bye Bye Blackbird" from Ty Hardin and Jerry Van Dyke and a heavy-handed swing pop twist Vegas orchestra thing from Robert Conrad called "A Little Bit of Give". The rest of the record is taken up by instrumentals, mostly pretty rocking, and occupying that strange zone of rock, jazz, pop, commercial session work and soundtrack music all mixed together with other elements as necessary. The CD doesn't say who's playing what but I thought I heard Plas Johnson and some of the other players sound familiar. My favorite might be the "Palm Canyon Bossa Nova", which is where I thought I might hear Plas and has some really lovely guitar playing. The "Palm Springs Scramble" is a classic West Coast jazz crime movie number with an off kilter syncopation to it that gives it a rollercoaster feel. The guitar on all the tunes stands out for being so great, both the tone and what's played.